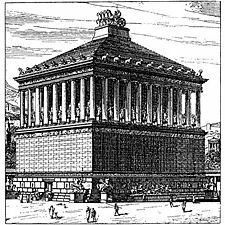 The Mausoleum of Maussollos (or Mausoleum of Halicarnassus) was a tomb built between 353 and 350 B.C.E. at Halicarnassus (present Bodrum, Turkey) for Maussollos, a governor in the Persian Empire, and Artemisia II of Caria, his wife and sister. The structure was designed by the Greek architects Satyrus and Pythis. It stood approximately 135 feet in height, and each of the four sides was adorned with sculptural reliefs created by four famous Greek sculptors—Bryaxis, Leochares, Scopas, and Timotheus. The finished structure was considered to be such an aesthetic triumph that the ancient historian Antipater of Sidon identified it as one of his Seven Wonders of the Ancient World. The word mausoleum has since come to be used generically for any grand tomb, though "Mausol—eion" originally meant "dedicated to Mausol." 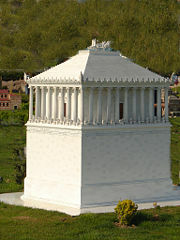 Modern buildings inspired by the mausoleum include Grant's Tomb in New York City; the Los Angeles City Hall; the Shrine of Remembrance in Melbourne, Australia; and the Scottish Rite House of the Temple on 16th Street in Washington, D.C. In 377 B.C.E. Halicarnassus was the capital of a small region and kingdom on the coast of Anatolia. In that year the ruler of the region, Hecatomnus of Milas, died and left the control of the kingdom to his son, Maussollos. Hecatomnus, a local governor under the Persians, took control of several of the neighboring cities and districts. After Maussollos and Artemisia, he had several other sons and daughters: Ada (adopted mother of Alexander the Great), Idrieus, and Pixodarus. Maussollos extended its territory as far as the southwest coast of Anatolia. Maussollos and Artemisia ruled from Halicarnassus over the surrounding territory for 24 years. Maussollos, although descended from local people, spoke Greek and admired the Greek way of life and government. He founded many cities of Greek design along the coast and encouraged Greek democratic traditions. Maussollos decided to build a new capital, a city as safe from capture and as magnificent as any to be seen. He chose the city of Halicarnassus and began to make it a capital fit for a warrior prince. At its port, if Maussollos's ships blocked a small channel, they would be able keep all enemy warships out. His workmen deepened the city's harbor and used the dredged sand to make protecting breakwaters in front of the channel. On land, they paved squares, built streets and houses for ordinary citizens, and on one side of the harbor they built a massive fortress-palace for Maussollos. From this palace, with clear views out to sea and inland to the hills, an enemy's advances would be clearly seen. 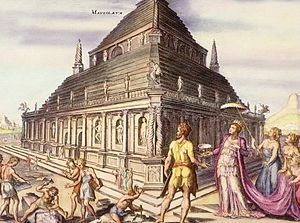 On land, the workmen also built walls and watchtowers, a Greek-style theater and a temple to Ares, the Greek god of war. Maussollos and Artemisia spent huge amounts of tax money to embellish the city. They commissioned statues, temples, and buildings of gleaming marble. In the center of the city, Maussollos planned to place a resting place for his body after he was dead. It would be a tomb that would forever commemorate his glory and that of his wife, who was also his sister and queen. In 353 B.C.E. Maussollos died, leaving Artemisia broken-hearted. It was the custom in Caria for rulers to marry their sisters. Such incestuous marriages kept the power and the wealth in the family. As a tribute to him, Artemisia decided to make the tomb he had planned truly splendid, a structure so famous that Maussollos' name is now the eponym for all stately tombs, in the word mausoleum. The construction was also so beautiful and unique it became known as one of the Seven Wonders of the Ancient World. Soon after construction of the tomb began, Artemisia found herself in a crisis. Rhodes, a Greek island at the Aegean Sea, had been conquered by Maussollos. When the Rhodians heard about his death, they rebelled and sent a fleet of ships to capture the city of Halicarnassus. Knowing that the Rhodian fleet was on the way, Artemisia hid her own ships at a secret location at the east end of the city's harbor. After troops from the Rhodian fleet disembarked to attack, Artemisia's fleet made a surprise raid, captured the Rhodian fleet and towed it out to sea. Artemisia put her own soldiers on the invading ships and sailed them back to Rhodes. Fooled into thinking that the returning ships were their own victorious navy, the Rhodians failed to put up a defense and the city was easily captured, quelling the rebellion. Artemisia lived for only two years after the death of her husband. The urns with their ashes were placed in the yet unfinished tomb. The bodies of a large number of sacrificed animals were placed on the stairs leading to the tomb, and then the stairs were filled with stones and rubble, sealing the access. Artemisia spared no expense in building the tomb. She sent messengers to Greece to find the most talented artists of the time. These included Scopas, the man who had supervised the rebuilding of the Temple of Artemis. Other famous sculptors such as Bryaxis, Leochares, and Timotheus joined him, as well as hundreds of other craftsmen. The tomb was erected on a hill overlooking the city. The whole structure sat in an enclosed courtyard. At the center of the courtyard was a stone platform on which the tomb sat. A stairway flanked by stone lions led to the top of the platform, which bore along its outer walls many statues of gods and goddess. At each corner, stone warriors mounted on horseback guarded the tomb. 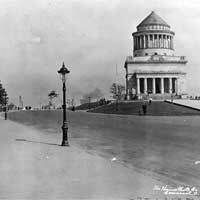 At the center of the platform, the marble tomb rose as a square tapering block to one-third of the mausoleum's 135-foot height. This section was covered with bas-reliefs showing action scenes, including the battle of the centaurs with the lapiths and Greeks in combat with the Amazons, a race of warrior women. On the top of this section of the tomb sat 36 slim columns, nine per side, which rose for another third of the height. Standing between each column was a statue. Behind the columns was a solid cella-like block that carried the weight of the tomb's massive roof. 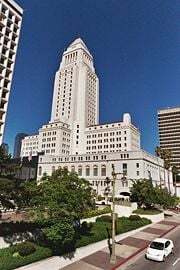 The roof, which comprised most of the final third of the height, was pyramidal. Perched on the top was a quadriga: four massive horses pulling a chariot in which rode images of Maussollos and Artemisia. The mausoleum overlooked the city of Halicarnassus for many centuries. It was untouched when the city fell to Alexander the Great in 334 B.C.E. and still undamaged after attacks by pirates in 62 and 58 B.C.E. It stood above the city's ruins for some sixteen centuries. Then a series of earthquakes shattered the columns and sent the bronze chariot crashing to the ground. By 1404, only the very base of the structure was still recognizable. In the early fifteenth century, the Knights of St. John of Malta invaded the region and built a massive castle. When they decided to fortify it in 1494, they used the stones of the mausoleum. In 1522, rumors of a Turkish invasion caused the Crusaders to strengthen the castle at Halicarnassus (which was by then known as Bodrum) and much of the remaining portions of the tomb were broken up and used in the castle walls. Sections of polished marble from the tomb can still be seen there today. At this time a party of knights entered the base of the monument and discovered the room containing a great coffin. In many histories of the mausoleum one can find the following story of the party, deciding it was too late to open it that day, returned the next morning to find the tomb, and any treasure it may have contained, plundered. The bodies of Maussollos and Artemisia were missing, too. The knights claimed that Muslim villagers were responsible for the theft, but it is just as likely that some of the Crusaders, themselves, plundered the graves. Today, on the walls of the small museum building next to the site of the mausoleum one finds a different story. Research done by archaeologists in the 1960s shows that long before the knights came, grave robbers had dug a tunnel under the grave chamber, stealing its contents. Also the museum states that it is most likely that Maussollos and Artemisia were cremated, so only an urn with their ashes was placed in the grave chamber. This explains why no bodies were found. Before grinding and burning much of the remaining sculpture of the mausoleum into lime for plaster, the knights removed several of the best works and mounted them in the Bodrum castle, where they stayed for three centuries. In the nineteenth century a British consul obtained several of the statues from the castle, which now reside in the British Museum. In 1852 the British Museum sent the archaeologist Charles Thomas Newton to search for more remains of the mausoleum. He did not know the exact location of the tomb, and the cost of buying all the small parcels of land in the area to search for it would have been astronomical. Instead, Newton studied the accounts of ancient writers such as Pliny to obtain the approximate size and location of the memorial, then bought a plot of land in the most likely location. Digging down, Newton explored the surrounding area through tunnels that he dug under the surrounding plots. He was able to locate some walls, a staircase, and finally three of the corners of the foundation. With this knowledge, Newton was able to determine which plots of land he needed to buy. Newton then excavated the site and found sections of the reliefs that decorated the wall of the building and portions of the stepped roof. Also discovered was a broken stone chariot wheel some seven feet in diameter, which came from the sculpture on the mausoleum's roof. Finally, he found the statues of Maussollos and Artemisia that had stood at the pinnacle of the building. From 1966 to 1977, the mausoleum was thoroughly researched by Prof. Kristian Jeppesen of Aarhus University in Denmark. He has produced a six-volume work on the Mausoleum titled The Maussolleion at Halikarnassos. The beauty of the mausoleum was not only in the structure itself, but in the decorations and statues that adorned the outside at different levels on the podium and the roof: statues of people, lions, horses, and other animals in varying scales. The four Greek sculptors who carved the statues: Bryaxis, Leochares, Scopas and Timotheus were each responsible for one side. 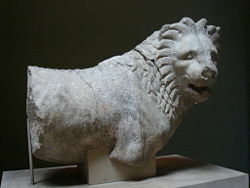 Because the statues were of people and animals, the Mausoleum holds a special place in history, as it was not dedicated to the gods of Ancient Greece. Nowadays, the massive castle of the Knights of Malta still stands in Bodrum, and the polished stone and marble blocks of the mausoleum can be spotted built into the walls of the structure. At the site of the mausoleum itself only the foundation remains, together with a small museum. Some of the surviving sculptures at the British Museum include fragments of statues and many slabs of the frieze showing the battle between the Greeks and the Amazons. There the images of Maussollos and his queen forever watch over the few broken remains of the beautiful tomb she built for him. 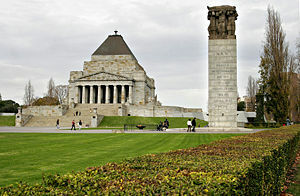 Modern buildings based upon the Mausoleum of Maussollos include Grant's Tomb in New York City; Los Angeles City Hall; the Shrine of Remembrance in Melbourne, Australia; the spire of St. George's Church Bloomsbury in London; the Indiana War Memorial in Indianapolis; and the Ancient Accepted Scottish Rite Southern Jurisdiction's headquarters, the House of the Temple in Washington, D.C.
All links retrieved September 5, 2018. The Tomb of Mausolus – W. R. Lethaby. History of "Mausoleum of Maussollos"
This page was last modified on 5 September 2018, at 16:13.